Lobang Queen: Beauty Lobang: Buy coupon online! Beauty Lobang: Buy coupon online! Sorry for the long silence, was overseas and got back only today! 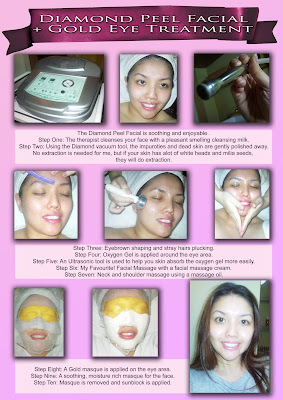 Am back with a great facial, the diamond peel facial + gold eye treatment lobang. Dermastrata vouchers are up for grabs, get the same facial I did for only $20. The catch is, I only have 20 vouchers to give away, so click on the button below to purchase the vouchers now. The great thing about this facial is that you will see instant results! Your face looks clearer, brighter and there is no pain of extraction. In face, this facial is so gentle and relaxing that I fell asleep at many points! The facial and upper back massage was a great touch as well! Disclaimer: I am an existing customer of Dermastrata, and all that is written here is my own opinion based on my own experience. Dermastrata is not paying me to create the above, photos were taken myself with my mobile phone. You can also call us at 63855675 after your payment to book your appointment. Remember to tell us the email address you used in this online payment. Deal Sites - Save More! Foodpon.sg - Deals for Food!